Beta Alpha Psi held our first ever Kiss The Pig Fundraiser recently and we are very proud to say that it was a HUGE success! Many thanks are due to the SHSU Faculty for getting involved in this event and to the members and candidates of Beta Alpha Psi for their hours of hard work to ensure that this event came to life. 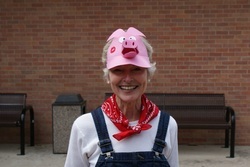 We would like to thank Mrs. Diane Green for being such a great sport and congratulate her on being the first ever winner of the SHSU Beta Alpha Psi Kiss The Pig Fundraiser!! Last but certainly not least, the members of Beta Alpha Psi would like to thank Mrs. Shyanne Stokes of Piggly Wiggly Mini Pigs for allowing us to "borrow" one of her precious babies for our event. We could not have done any of this without her support. We are forever grateful! 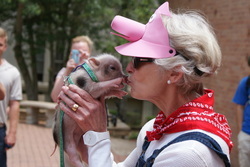 Be sure to stop by Mrs. Stokes' website and take a look at her adorable mini pigs!